The Jawaharlal Institute of Postgraduate Medical Education and Research (JIPMER) is scheduled to conduct MBBS entrance examination on 3rd June 2018. A huge number of candidates who are looking for the admissions into MBBS program applied for the exam. 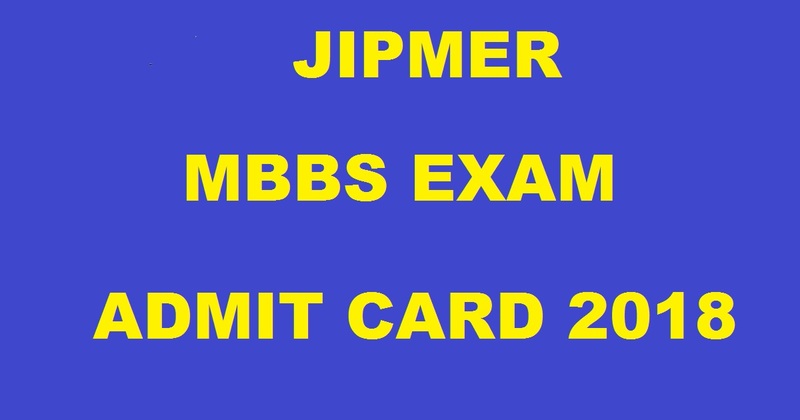 Candidates who had applied are searching for the JIPMER MBBS Admit Card 2018 as it is the crucial document to carry for the exam and contains details regarding exam venue, roll number etc. JIPMER is going to release MBBS Entrance admit card today. Candidates can download admit card from the direct link provided below. The Jawaharlal Institute of Postgraduate Medical Education & Research (JIPMER) is a medical school in India. JIPMER is both an educational institute that imparts undergraduate and postgraduate medical training and a working hospital that provides inexpensive medical care to a large number of patients. The institute conducts research actively in modern medicine, public health and medical education. Every year JIPMER conducts various entrance examinations. This year it has released the notification for MBBS exam and the candidates who had applied can download admit card from the official website. JIPMER released notification and invited online applications for the MBBS entrance examination. A huge number eligible and interested candidates applied for the exam. Candidates who had applied can download the JIPMER MBBS Admit Card 2018 from the direct link provided below. Without admit card candidate is not allowed to write the examination. The morning shift exam will start at 10 am and the entry to the center will close at 9:15 am. The afternoon shift will start at 3 PM and the entry to the center will close at 2.15 PM. The MBBS entrance test will be of two hours and thirty minutes duration. It will be conducted in online mode. There will be 200 objective type questions (MCOs) ( 60 each from physics, chemistry and biology and 10 each from English language and comprehension and logical and quantitative reasoning). The questions will be based on syllabus prescribed by the state board for the higher secondary students and for CBSE Class 11 and 12. 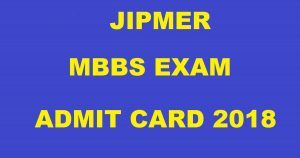 Click on JIPMER MBBS Admit Card 2018. Enter your Application number and password in the provided fields. Stay tuned to this website. We will update JIPMER MBBS results here. Press CTRL+D to bookmark this page for easy navigation.